Haro is a famous wine producing town in Northern Spain located in the La Rioja region. It is home to many of the most famous of Spain's greatest Bodegas, and the old town was declared a Historic-Artistic Site by the Spanish government in 1975. 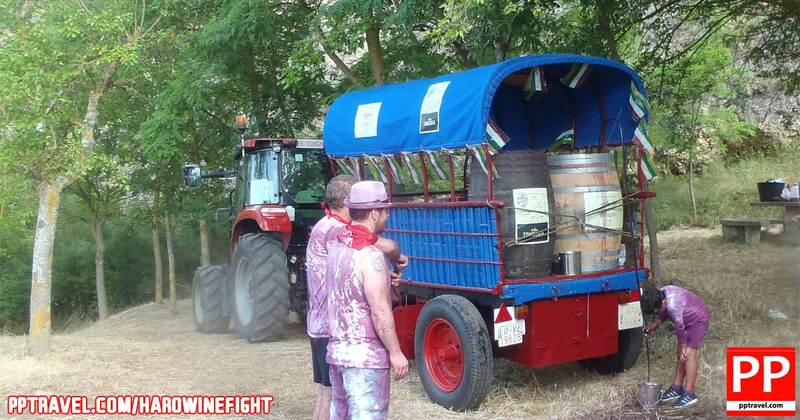 But it is the well-known Haro Wine Fight or Batalla del Vino, which brings the tourists here each year in late June. Getting to Haro is really quite simple, with excellent links via train and bus from Madrid, Zaragoza, Bilbao, San Sebastian, Pamplona and Logrono. The closest airports are at Bilbao, Santander, Logrono, Pamplona and Biarritz but certainly the biggest of these with direct flights from London is Bilbao right on the north coast of Spain. There is a local bus service three times per hour outside the airport which connects to the inter-city bus station in the centre of Bilbao where a connection can be caught to Haro. Almost all bus reservation websites in Spain do not permit making a reservation until 30 days out from the date you wish to travel so you will need to make sure you keep your eye on the dates for bus seats being released for public sale. Trains also travel regularly between Bilbao and Haro although they do tend to take longer than buses do but have a much better vantage point of the beautiful Basque Region surrounds on the way. The best website in English to book both buses and trains in Spain is goeuro.co.uk. PP Travel usually travels between Bilbao and Haro for the Haro Wine Fight via bus and we've always found it to be a very easy process.